The reaction quotient is essentially the quantitative application of Le Châtelier’s Principle. It is determined using the law of mass action. However, you can use the concentration or pressure values at any point in the reaction to calculate Q. (Remember, you can only use concentrations or pressures of reactions at equilibrium to calculate K). The value for the reaction quotient can be compared to the value for the equilibrium constant to predict in which direction a reaction will shift from the given set of initial conditions. [A], [B], [C], and [D] are initial molar concentrations or partial pressures. · If Q is less than K, the reaction shifts right. · If Q is greater than K, the reaction shifts left. 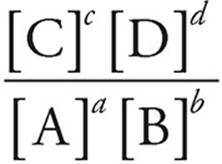 · If Q=K, the reaction is already at equilibrium. (a) Determine the equilibrium constant if the following concentrations are found at equilibrium. Use the reaction quotient to determine which way the reaction needs to shift to reach equilibrium. 0.021 is less than the equilibrium constant value of 0.16, so the reaction must proceed to the right, creating more products and reducing the amount of reactant in order to come to equilibrium.